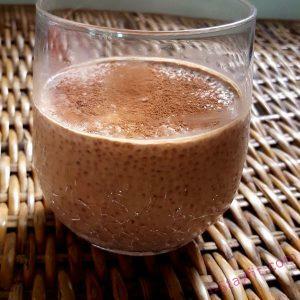 Chia pudding is a very nutritious and delicious dessert or breakfast. The variety is limitless. Before I started on keto diet, I would regard it with caution. I saw them in the fridge section of supermarkets and thought who would want to pay for such simple snack. It’s just chia seeds in some kind of liquid, a no-brainer really. Out of curiosity I made my first chia puddings with coconut cream and mango, strawberry and cream and mocha and thought why haven’t I made them sooner. It’s crucial on keto diet to have enough fat and not too much carb. Chia pudding comes in handy because you can load it up with cream and keep the carb low by using low carb ingredients. 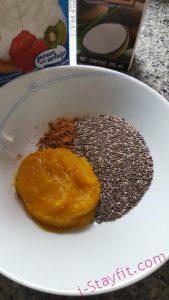 Today we would like to share our pumpkin spice chia pudding although it’s already past thanksgiving and pumpkin spice latte has become yesterday. We don’t use canned pumpkin puree but opted for cooked pumpkin. The local variety here is not orange in color but rather greenish yellow and less sweet but it still gives smooth texture to the pudding. We use both heavy cream and coconut cream to give more interesting flavor. All you have to do is to combine all ingredients and stir till well-blend and chill. Combine cream, coconut milk, coffee and pumpkin pureé together and mix well. Slowly drizzle chia seeds and stir constantly to keep it from lumping. Add pumpkin pie spice and sweetener. Beat till all combined and smooth. Chill in the fridge for at least 2 hours, the longer the better. Chia pudding is something you can make well ahead of time. It's best left in the fridge overnight. You can make a big batch and store in single serving mason jars and have it ready anytime for a quick snack or dessert.